Happy holidays everyone! Please enjoy this special episode of Serious Nibbage! If you’d like to sponsor an episode of Serious Nibbage and would like us to review a pen/nib/ink, etc, contact me through the contact page, or via email. This entry was posted in Fountain Pens, Humour, Reviews, Serious Nibbage and tagged EDC, Franklin-Christoph, GourmetPens, KarasKustoms, Kaweco, Lord Winderemere, OMAS, Prof. dr. Tarquin Danglebury, Serious Nibbage on December 20, 2014 by Azizah Asgarali. Azizah and I discuss the KarasKustoms Ink. Thanks to KarasKustoms for providing these pens! Are they Serious Nibbage? My review of the KarasKustoms Ink fountain pen. 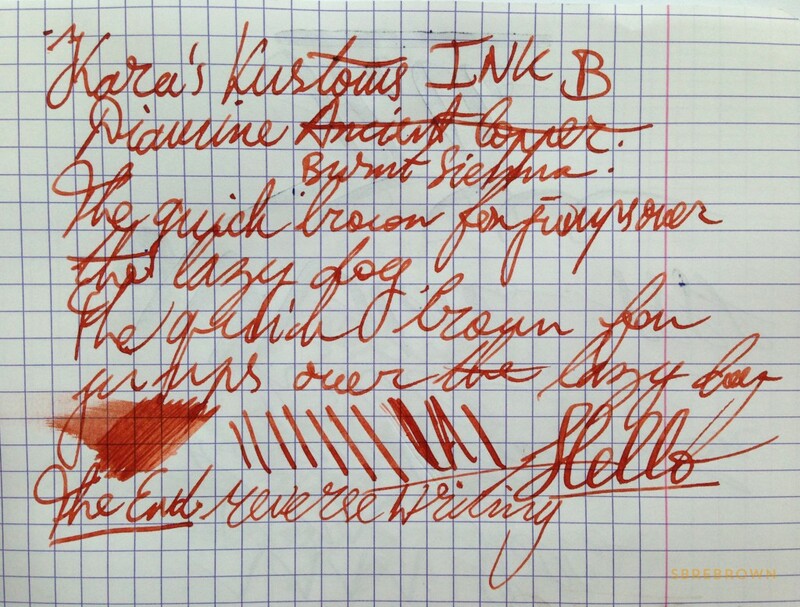 GourmetPens’ review of the KarasKustoms Ink fountain pen. This entry was posted in Fountain Pens, Humour, Reviews, Serious Nibbage and tagged EDC, Fountain Pens, GourmetPens, KarasKustoms, Reviews, Serious Nibbage on December 12, 2014 by Azizah Asgarali. My review of the KarasKustoms Ink fountain pen in black aluminum with a brass section, and a broad steel nib. Thank you to KarasKustoms for providing this pen for review! This entry was posted in Fountain Pens, Reviews and tagged EDC, Fountain Pens, KarasKustoms, Reviews on December 11, 2014 by Azizah Asgarali.